Peach season is pretty much the best time of the year, am I right?! I love going to “pick your own” farms or buying a large box from a local vendor. Peaches are one of those things I could never get sick of! I have too many favorite peach recipes that I rotate through them each season, starting with my favorite homemade Peach freezer jam. 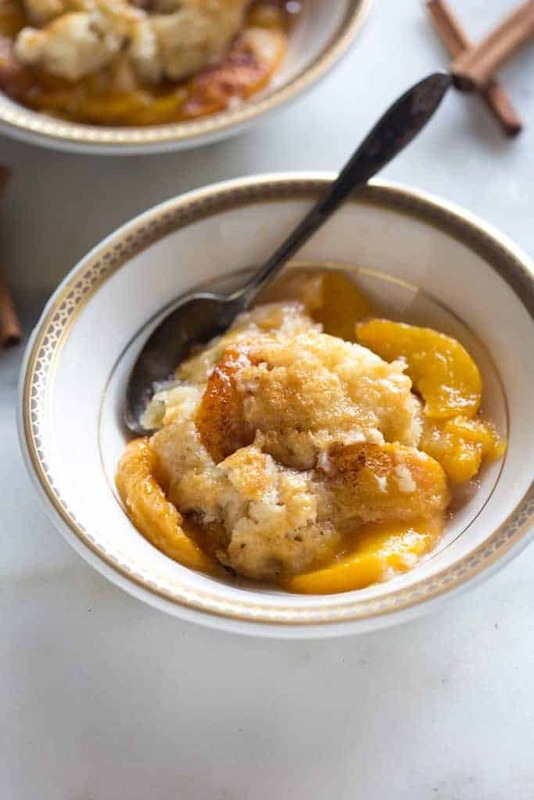 This peach cobbler recipe comes from my mom, and it is a family favorite recipe she made for us all the time growing up! The best part about it is that it literally takes 5 minutes to throw together! 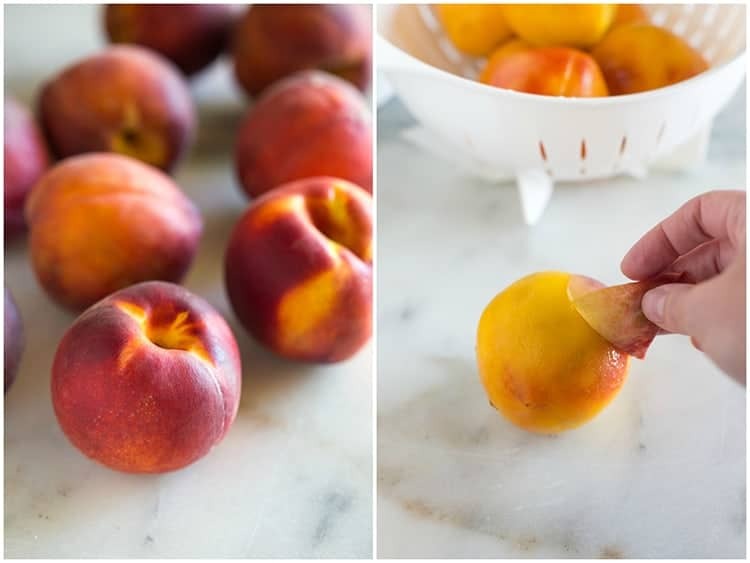 My mom often used a quart jar of homemade canned peaches, but you can also use fresh peaches! I’ve found the easiest way to peel peaches is to gently lower 2-3 peaches at a time into a pot of boiling water. Leave them in the water for about 30 seconds, and then remove them to an ice-water bath. 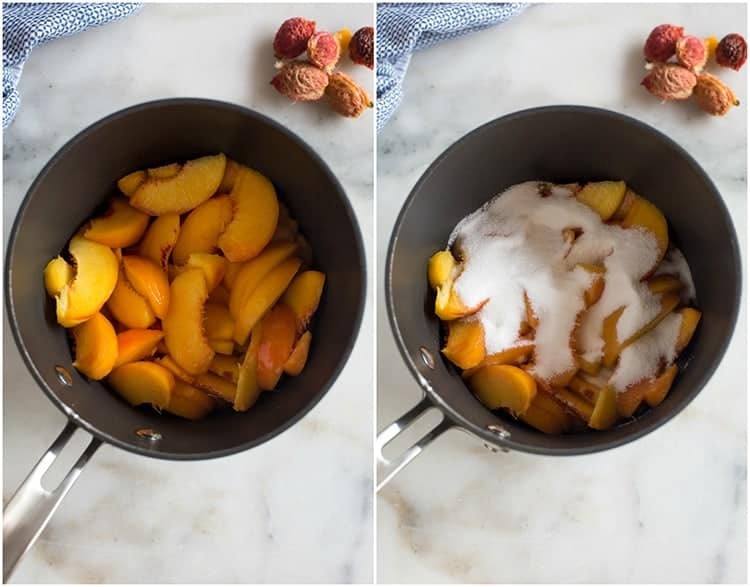 The ice water bath will shock them and keep the peach flesh from cooking, but the peach skin will be so easy to peel that you wont even need a knife! Add the sliced peaches, sugar and salt to a saucepan and stir to combine. Cook on medium heat for just a few minutes, until the sugar is dissolved and helped to bring out some juice from the peaches. Remove from heat and set aside. 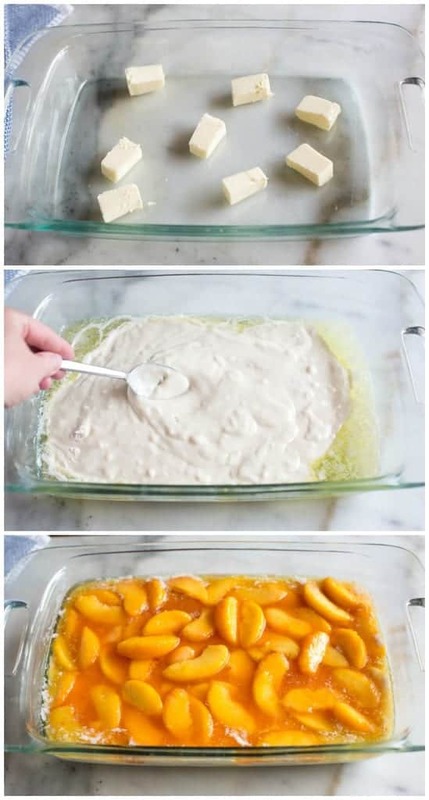 Preheat oven to 350 degrees F. Slice butter into pieces and add to a 9×13 inch baking dish. Place the pan in the oven while it preheats, to allow the butter to melt. Once melted, remove the pan from the oven. Bake at 350 degrees for about 40 minutes. Serve warm, with a scoop of ice cream, if desired. 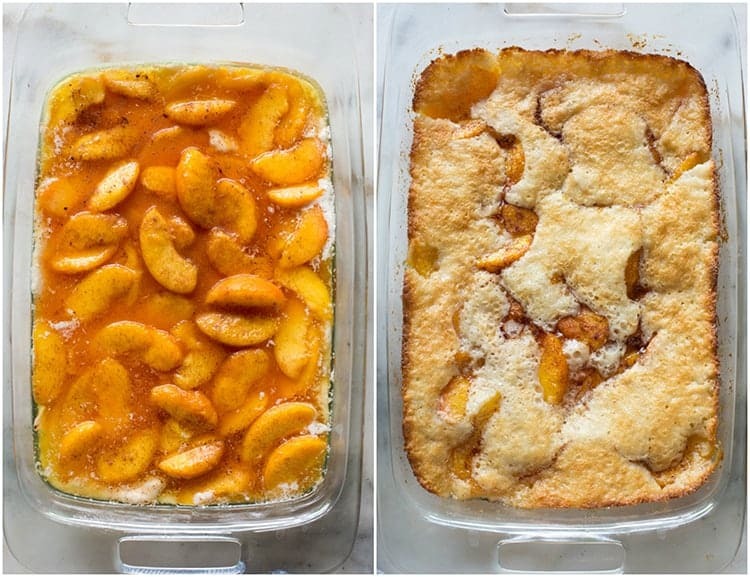 Peach cobbler is best enjoyed warm, right after it’s baked. Store leftover cobbler covered, in the fridge for 4-5 days. To reheat peach cobbler, use the microwave or oven. To reheat in the oven, remove it from the fridge and allow it to come to room temperature. Bake at 350 degrees F for about 20 minutes or until warmed through. (Place tinfoil over it if it’s browning too much). Tell me this isn’t the epitome of comfort food desserts?! 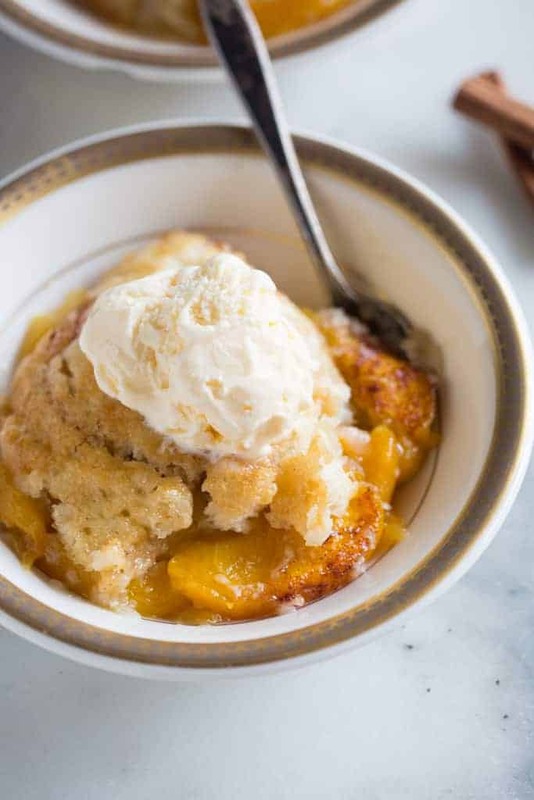 A bowl of warm peach cobbler served with a small scoop of vanilla ice cream on top is seriously my idea of heaven. 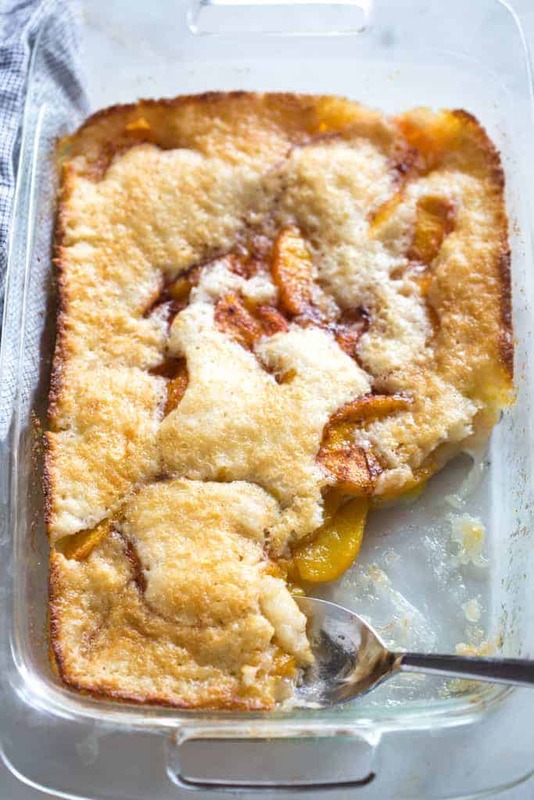 This old fashioned Peach Cobbler recipe is not only extremely easy to make from scratch, but it's made with fresh or canned peaches so you can enjoy it all year round! To substitute canned peaches, use 1 quart jar, undrained. *I first shared this recipe in August 2014. Updated July 2018. 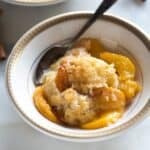 I’ve used this recipe a couples times now and everyone says it’s the best peach cobbler they’ve ever had. It’s so good I make a seperate one for myself just so I can enjoy it without having to share it with anyone else. However, the last time I tried to make it it could all runny and would not bake at all. I did everything I always do but I can’t figure out what went wrong maybe someone can enlighten me on what could cause this? Yes, substitute 1 quart jar, undrained and skip steps 1 and 2 of the directions. WOW Amanda Lynn you are sooooooo offensive!!! You didn’t deserve a reply!